Not to be a total downer (see the uplifting post below on the state of the world’s rivers), but according to new research released this week, more than a fifth of the world’s plant species faces the threat of extinction, a trend with potentially catastrophic effects for life on Earth. Up until now, the earth’s mammals were thought to be more seriously imperiled by the risk of extinction but the study, entitled Sampled Red List Index for Plants, concludes that plants are just as threatened as mammals. The research provides a major baseline for plant conservation and is the first time that the true extent of the threat to the world’s estimated 380,000 plant species is known. Why should we care about some trees and shrubs? Quite simply, because plants provide the foundation for most of the world’s ecosystems and are vital for providing food, clean water and soil, medicine and regulating our climate. And the reason for the demise of plants? You guessed it – humans. One of the greatest threats facing plants today, is the conversion of natural habitats for agriculture or livestock use. The report says that human activities (81 percent) far outweigh natural threats (19 percent) to plant biodiversity and are being fueled by agriculture, logging, plantations and livestock. And the most threatened habitat is tropical rainforest. For instance, Bachman says the situation in Indonesia — where Western demands for Indonesian palm oil grown on land once covered in rainforests — highlights the new interconnectedness of responsibility. And the loss of tropical rain forest can be attributed to many factors from multinational logging companies to poor farmers just trying to make a living. 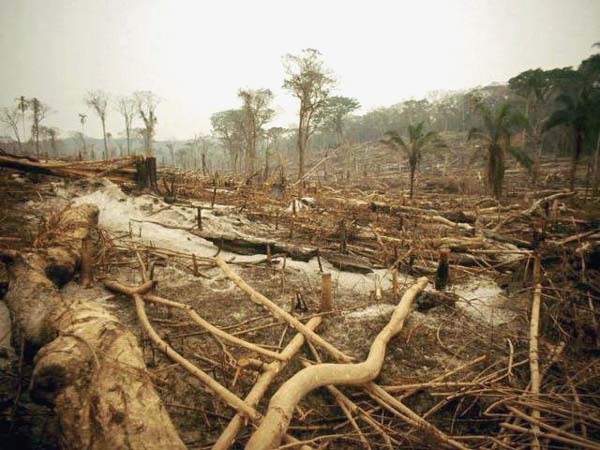 There is more immediate money to be made from destroying natural ecosystems than from preserving them – despite the myriad health, social and even economic benefits that healthy, intact forests provide. This latest dire news comes in the lead up to a major international biodiversity meeting in Nagoya next month. A 2010 Biodiversity Target was set in April 2002, when governments that are Parties to the Convention on Biological Diversity committed themselves to achieve by 2010 a significant reduction of the current rate of biodiversity loss at the global, regional and national levels as a contribution to poverty alleviation and to the benefit of all life on Earth. But in April, a report on over 30 indicators concluded that world leaders have failed to reduce the global rate of biodiversity loss by 2010 and have instead overseen “alarming” biodiversity declines. The UK Government has been championing a new system to identify the financial value of natural resources, and the potential hit to national economies if they are lost. The Economics of Ecosystems and Biodiversity (Teeb) project has begun to calculate the global economic costs of biodiversity loss. Initial results paint a startling picture. The loss of biodiversity through deforestation alone will cost the global economy up to $4.5 trillion each year – that’s 4.5 TRILLION dollars or $650 for every person on the planet every year, and just a fraction of the total damage being wrought by overdevelopment, intensive farming and climate change. In addition, the annual economic value of the 63 million hectares of wetland worldwide is said to total $3.4 billion. In the pharmaceutical trade, up to 50 per cent of all of the $640 billion market comes from genetic resources. Anti-cancer agents from marine organisms alone are valued at up to $1 billion a year. So there is serious money at stake here but this doesn’t mean much for a peasant farmer in Indonesia trying to eke out a living who needs money now to feed his family. Nor does it seem to mean much to a huge industrial forestry company that is driven by maximizing profits (as are all companies in a capitalist economy) and by pleasing its shareholders who are demanding the highest possible return on their investments.